So here's my block layout for Belle Meade, I've decided to go with a random placement, and was able to put together a pleasing arrangement with very little drama. I started in the center and worked my way out and around. After getting all the blocks on my design wall, I moved a few around then went to bed. First thing the next morning I took another looksie, moved a couple of blocks and decided on this. There are 22 red blocks, 13 dark and 9 light, and 19 blue blocks, 12 dark and 7 light. here's blue . . .
here's red . . . Same block placement, the only difference is the setting triangles. Isn't it amazing how the blue really pulls out the blue and the red really pulls out the red? So that got me to thinking maybe going with red AND blue would be the way to go. So that's all the choices I could come up with, I'm leaning towards 4, not for any particular reason other than I just like the way it looks. I'm very happy with this project, for someone who doesn't really like blue, I really like the look and romantic feel of this quilt. This quilt pattern has an optional containment border and outer border, but I like it just this size, so once I get my setting triangles on and rows connected, Belle Meade will be done! 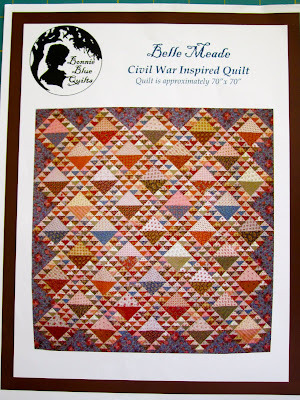 Nicole is working on Belle Meade too, I think she's finished all her blocks and we hope to have our quilts done and ready for our final big reveal on Friday. First, just let me say, I was thrilled by the number of folks who stopped by and left their opinion on my block placement for Belle Meade! The overwhelming favorite was option number two, where I alternated the blocks. Then it was pretty even for support for Red Row Blue Row versus Totally Random. I have decided to throw out option one, Red Row Blue Row, because I want more blue in the quilt (aren't you shocked, knowing me and blue, I think I may be growing as a quilter!). Option one would give me 16 blue blocks and 25 red blocks. I think the red over powers the blue, so I think more blue blocks will help with that. In addition to enjoying all the comments as they came in, I was so impressed that you're able to not only say which option you like, but explain why! Right now I only know what I like and what I don't, I just can't put my finger on the why, it was a wonderful learning experience for me to read how you came up with your decision. That's something I think I'll work a little harder on in the future, to stop and think about the "whys" of my likes and dislikes. So here's my plan, I need to finish my blocks, then I'm going to see if I can go totally random, hey, it's a new year and I'm feeling artistic! If totally random drives me totally insane, then I'll go with alternating the blocks. But like you all said, with this fabric and this pattern, I can't make a bad choice. My goal is to finish my blocks and placement over the weekend, then we get to think about our setting triangles...that should be Monday's post, so stop back by! 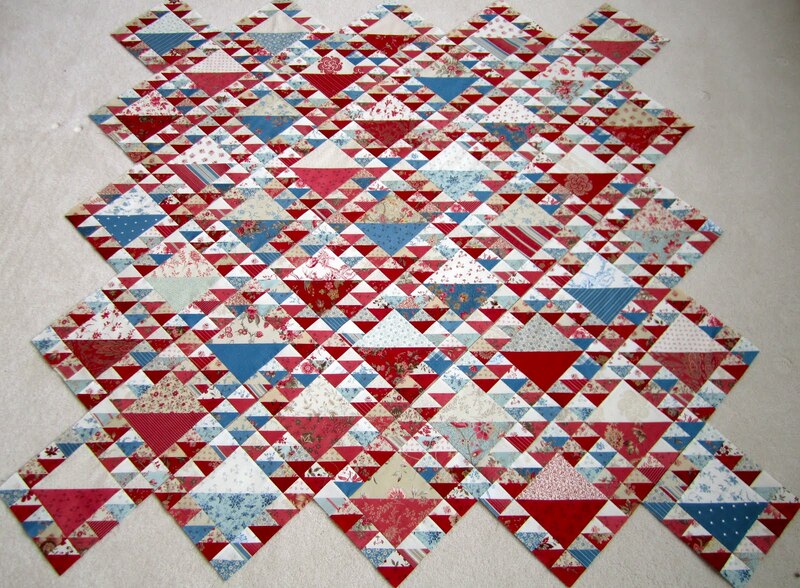 While I'm finishing up Belle Meade, I thought I would share another quilt for my Lifetime Quilt List. One of the goals when I started my blog was to have at least one post for every quilt I've ever made, and I'm getting closer to that goal. When I was visiting my daughter after Christmas I was able to snap a few pictures of Lifetime Quilt #9! My ninth quilt, I've made 56 quilts since I made this one, where does time go! Anyway, it's just a simple Double Irish Chain using that same Santa fabric I used in my Red and White Snowball Challenge quilt that I gave to my Dad (Lifetime Quilt #53) this year. This quilt is around 60 X 80 and has approximately 433 pieces. I can still remember when I started on this quilt how I just loved all those Santa faces smiling at me, but by the time I had it all pieced, I was tired of those Santas staring back at me, and didn't want to look them in the eye anymore! Which is why my daughter has this quilt. I've not seen it in years, since she only has it out for Christmas and I'm not usually in her home around the holidays. But the Santas look happy to me again and it felt great to see this quilt, like seeing an old friend. 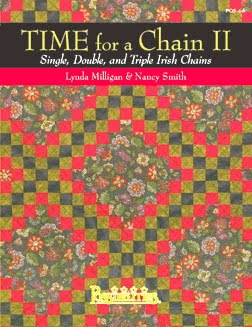 I used Nancy J Smith and Lynda S Milligan, The Possibilities girls, Time for a Chain book for this quilt. They now have a newer version of that book, Time for a Chain II. This is a great book, particularly for a beginner, the instructions are wonderful and they provide multiple block size and finished size options for each quilt, be it single, double or triple Irish chain. because it's red, and because it holds 12 ounces of coffee and 2 tablespoons of fat free french vanilla creamer perfectly, what's not to love. I just hope it makes it to Valentines Day. I'm also loving Belle Meade, not much to show in the way of progress, it's been a busy week, but what little time I've spent on that project has been pure joy. I've started working on a hand applique quilt from this wonderful book by Blackbird Designs, Country Inn. It's been ages since I've been this excited about trying something new, but so far, it's been nothing but fun, and I hope to be able to share my first completed block in the next week or two. I'm using just a normal run of the mill Home Depot drapery rod, nothing fancy or quilt specific. nothing fancy, just run of the mill Home Depot drapery clips. I use several clips, probably twice as many as is really required. I just wanted to make sure I had enough clips so that any one clip wasn't holding on to more of the weight of the quilt than it should. 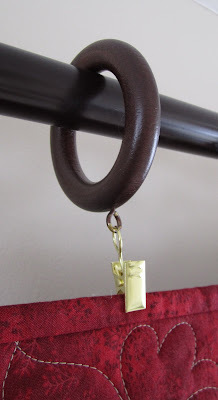 I did take a piece of wire and wrap it around the last ring on each end, and each bracket, to keep the quilt centered in the middle of the rod. I suspect the quilting job has a lot to do with how well it hangs, it's evenly distributed and a nice amount, not too much or too little. I'll probably hang another quilt up there in a month or two, but so far I've been lucky enough to have two quilts that have hung perfectly, I hope I have better luck hanging quilts than keeping mugs. I'm loving that today is Friday and looking forward to loving the weekend, I hope you're working on something that's giving you that lov'n feeling! My Friday was pretty much spent in my sewing room, who could ask for a better day? and have to say, it IS and inspiration block, I love it! What a great start, I have a good feeling about this quilt. 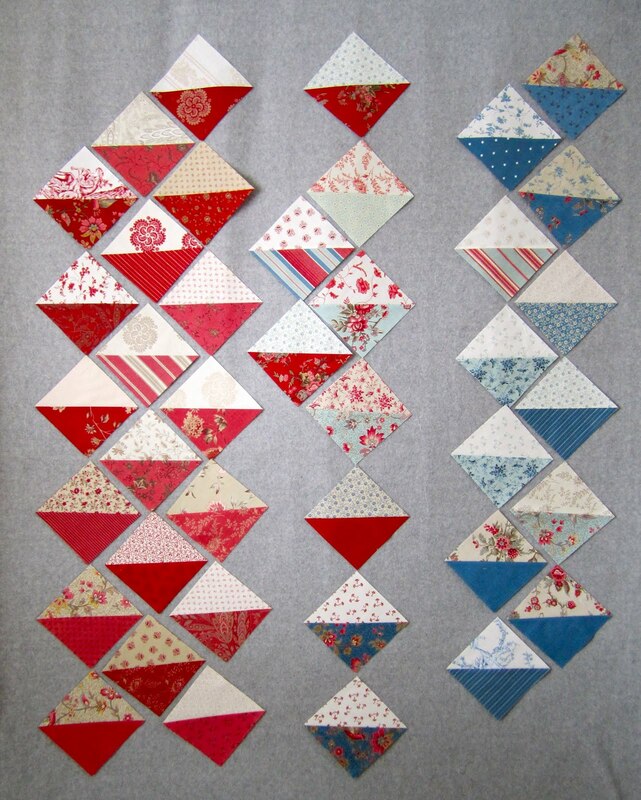 I also made my large half square triangle units . . . . Sounds like a fun, drama free week.......plus there's snow in the forecast, could it get any better than that? Hope your Monday is low key and drama free!! Nicole at Sister's Choice Quilts is also working on Belle Meade using French General fabric, be sure to check out her progress today! Eventide update, several folks ask where they could purchase the pattern Eventide designed by Carrie Nelson for Miss Rosie's Quilt Company, it's now out, look for it where you usually buy Miss Rosie patterns, I got mine at the Fat Quarter Shop! My sewing room is all cleaned up from Red, White and Wonderful, although, since it was a kit, there wasn't much to clean up in the way of scraps. Normally, when I work on a project, I have a pretty good stack of leftovers, because I'm an over cutter and over piecer, and like variety and choice. I pretty much used all that lovely Roman Holiday fabric on Red, White and Wonderful. I may be able to piece a small mug rug or pin cushion with the leftovers, that fabric is too valuable to waste and I intend to use each little bit. Now it's time for the next project that I was supposed to start January 1st, but since I'm the boss of my schedule, this project was pushed to today, January 14th, and that's OK. Finally, I'm starting Belle Meade, and Nicole, over at Sister's Choice Quilts, she's starting Belle Meade today too. Well technically we started this project back in October, when we decided to get a jump start on the 656 two inch finished half square triangles that this pattern requires. The one thing I have decided on,the fabric, I'm using French General by Moda. I'm mainly using Rural Jardin, but there's some Rouenneries (remember how hard that was to spell when it first came out, now we all know how to spell it....but who knows how to say it, that's the question...I say roon-ner-eeze but that doesn't sound French so I'm guessing that's wrong!!) and a little Lumiere de Noel. So here are my 656 half square triangles, ready to be sewn to 41 bigger half square triangles. I used the Easy Angle ruler to make my hst units, the ruler worked well for me, I will use the same method the next time I need a large number of hst units for another project. If I don't add the optional borders, this project will have 758 pieces when finished. Here's everything ready to go, just setting on my work shelves. 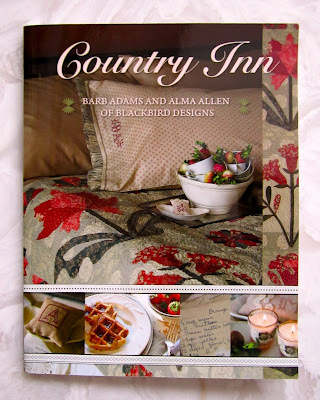 Nicole is blogging about Belle Meade today too, so be sure to stop over there to get her take on this project. I think we're are hoping to provide weekly updates on our progress, so stay tuned. Hey Nicole, ready, set, SEW . . . . . . . Here it is, my first official finish for 2011, and it's a keeper!! Red, White and Wonderful by Gerri Robinson. So the last time you stopped by, I had the center blocks all pieced. As I mentioned in an earlier post, this project was a kit I bought from Lisa/Stashmaster. The border fabric is cut lengthwise, when I lined up my ruler, I lined it up down the middle, but cut it a half inch too narrow, which forced me to cut the opposite side a half an inch wider, giving me that cute little scallop design running down the left side of the inner border fabric. Don't you just love it when stuff like that happens!! So here it is, and I can't improve on the name, it is Red, White and Wonderful. My first finish for 2011.
and has approximately 201 pieces ( a new low for me I think!). I'm not familiar with Gerri Robinson, but someone left a comment that they had several of her patterns, so I did a little research and she has a wonderful website with some beautiful kits and patterns. 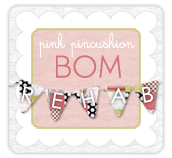 Her website is called Planted Seed Designs. I really love her Bellissima pattern made from Luna Notte by 3 Sisters for Moda. The pattern is in McCalls Quick Quilts February/March 2011 Magazine, out now. That makes two amazing patterns I've seen that used Luna Notte, Eventide, by Miss Rosie's Quilt Company and Bellissima.....and I've still not bought that fabric! Things are starting to get back to normal at our house after celebrating the holidays and heading out to California to see the Rose Parade. I've still not gotten all the decorations down and packed, but after not being home between Christmas and New Years, we've enjoyed having them out, as opposed to so ready to pack everything up on January 1st, like other years. Several folks gave me a perspective that had never occurred to me, and probably never would have; as I gain experience, I'm also expanding my likes and dislikes. When I first started quilting, I would make 2 or 3 quilts using the same pattern because I really didn't have any good direction or preference as to what to make, I just enjoyed sewing! My list of patterns, techniques and methods that I want to try grows weekly, why would I want to spend any amount of time on a project that doesn't suit, for any reason, just because I've started it!! 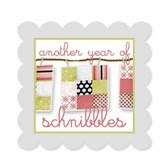 Thanks so much turning around what I considered a newly developed quilting character flaw, into a positive statement on my developing skills, which really cheered me up! It's been almost 3 weeks since I've spent any amount of time in my sewing room, but that changed today! 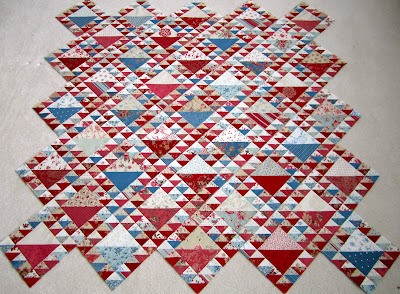 Let me reintroduce you to Red, White & Wonderful, the quilt that I thought would be my last finish for 2010, but instead will be my first finish for 2011.
and uses the wonderful fabric, Roman Holiday by 3 Sisters for Moda. 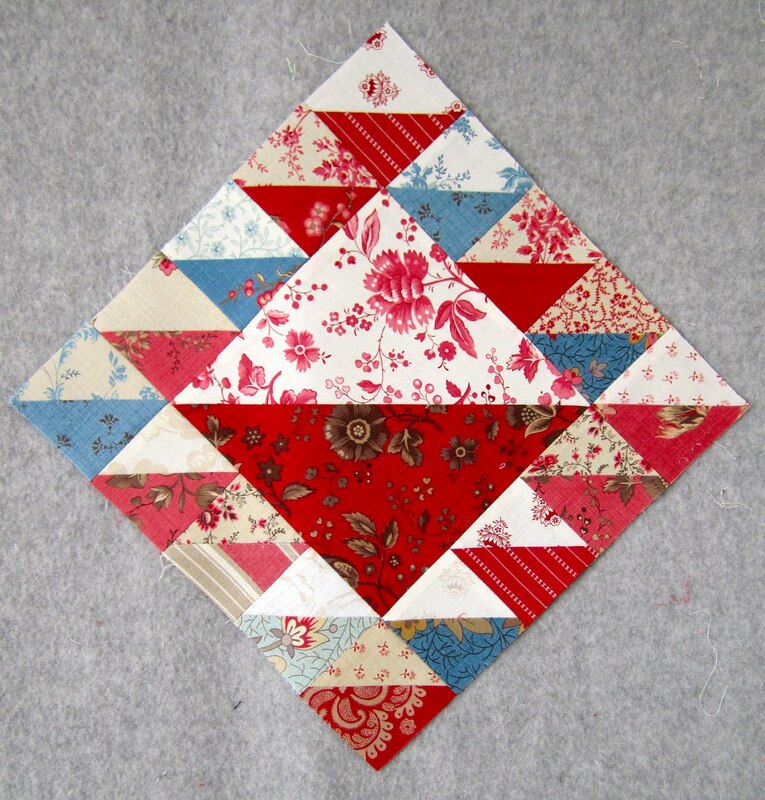 How can 2 simple blocks and 4 different fabrics make something so lovely, in this case, "less is definitely more"! That from the queen of "more is more"! All that's left is a couple of borders. Even though this is a Christmas quilt, and even though I didn't finish this project in 2010 like I wanted, I STILL love it! This is one project I'm going to enjoy finishing, this week!